I replaced my BlackBerry Curve with an Android smartphone (HTC Thunderbolt) in May. Although I still miss the BlackBerry’s superior handling of multiple email accounts and most of all BlackBerry Messenger, I don’t miss its less-than-stellar 2MP camera. The HTC phones all seem to have better than average cameras. The Thunderbolt has an 8MP camera and image quality in adequate light is probably better than that of my first digital point and shoot camera. 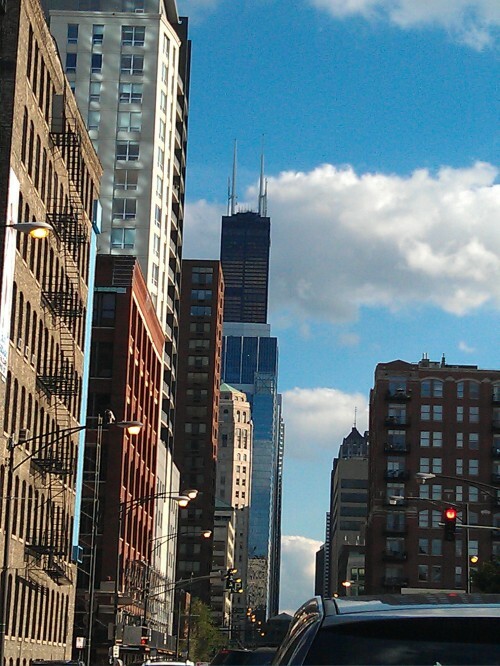 When I’m stopped at the light at Orleans and Ontario, every so often I use the phone to snap a photo of the Sears Tower. 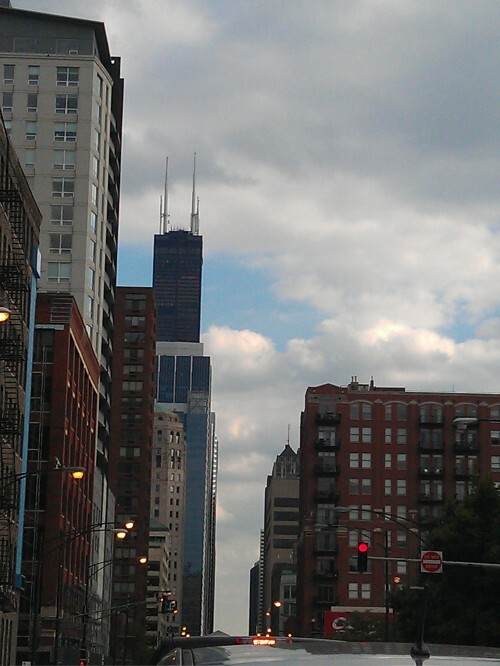 Or at least the top of the Sears Tower plus all of the other shorter buildings on Orleans. Yes, I know that is not its current name. I do not acknowledge that name. So far, luck has not had me stopped safely at the light for the most interesting cloud formations and lighting conditions. Eventually I’ll get them all, I hope. I apparently spoke too soon when I said that WordPress was back to normal. I’ve had some ongoing problems with 3.1.1 and some plugin or combination of plugins. I’m still not entirely sure what the magic combination is, but I think that this time, things are really, finally, back to normal. I’ve still been trying to keep my April NaBloPoMo going offline, so you will be seeing back posts appearing as I transfer them over. Since I had that bad moment with the WordPress 3.1.1 upgrade yesterday, I expected to be immune from technology meltdowns for a while. Not so much. Like yesterday, it was a first-time problem with a product that had always worked well for me. Clear’s 4G mobile broadband service has been reliable for me since I opened the account last July. Not today. I had lights and connection. I didn’t have the Internet. Fortunately there was an actual informative error message saying that it was unable to connect to an IP address that turned out to be a DNS server. Switching to Google’s DNS servers got me back online. The actual Clear DNS server was reachable at a later time. Can’t wait to see which technology bails on me tomorrow! I’m thinking about using Joomla! 1.6 for a major reboot of a website I maintain. So I’ve been wrestling with it all night. I just popped over here to make my daily post, and I see that WordPress 3.1.1 is waiting for me. I’ve been a little lax about updates and stuff, so I’m going to make this short and take care of my updates and scans and backups and such before heading off to bed. Good night, and hope with me that I don’t break anything!